Golden Coast is the exclusive distributor of Cover Valet products to the UK wet leisure industry. 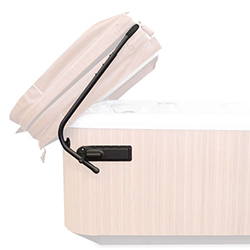 Cover Valet spa cover lifters and other spa products are distributed in the UK and Europe exclusively by Golden Coast. Based in Long Beach, California, Cover Valet produces Spa Side umbrellas, hand rails and steps as well as their range of cover lifters. With 5 different cover lifters in the range, Cover Valet appeal to every need and budget. 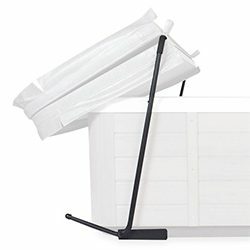 From the Cover Caddy, which is a gas spring assisted cover lift that quickly installs on a wide variety of spa shapes and sizes to the Cover EX, which has an aluminium and powder-coated construction and needs the minimum of clearance to fit. The Spa Side Umbrella is the leading alternative to traditional gazebos. Its versatility allows for 360 degrees of travel as well as a crank and tilt mechanism that affords trouble free operation. 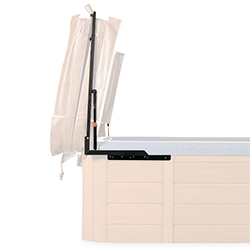 The Spa Side Handrail is one of the most user-friendly, spa access assistance products on the market and provides 360° of movement to allow for easy entry and exit.